Fort Bend County Levee Improvement District No. 2 (FBCLID2) has started a pilot project to armor a portion of the West Levee. 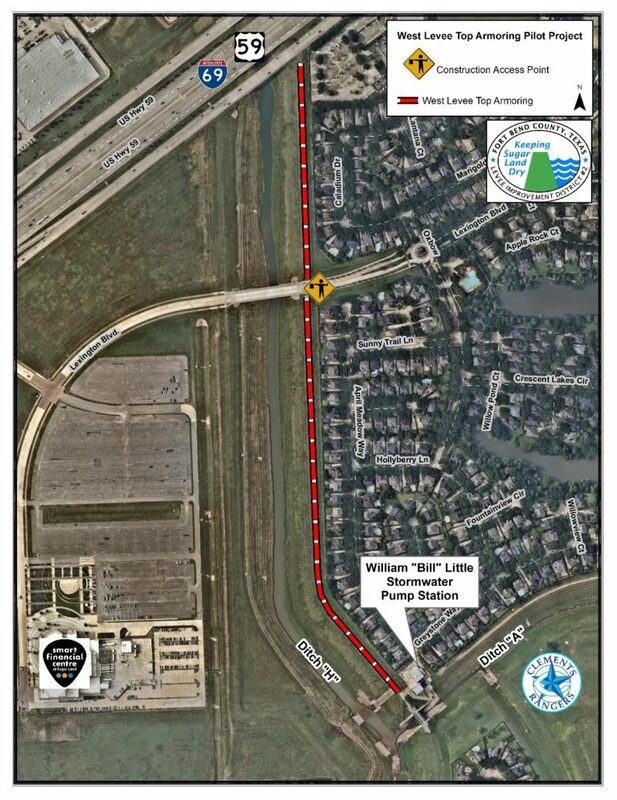 Approximately 3,000 feet of the West Levee between US-59/I-69 and the Bill Little Stormwater Pump Station on Greystone Way will be covered with articulated concrete blocks. Levees are an essential component of the FBCLID 2 flood protection system and must be routinely maintained and inspected. The armoring will provide a solid surface for inspection vehicles that results in less levee damage and reduces the need for future maintenance. Typically, after a heavy rain, vehicles are not allowed on the levee top due to the amount of rutting that will occur. After the armoring is installed the levee can quickly and easily be inspected under any conditions. The use of articulated concrete block will still allow grass to grow on the levee top, providing a green but resilient surface. The project will also add a new access ramp near US-59/I-69 that improves access to the West Levee and Pump Station during both emergency and normal operations. The West Levee Top Armoring Pilot Project will be complete by October 2018. The contractor will enter the construction site from Lexington Boulevard, as noted on the map. Please be aware of construction traffic when traveling through this area. For questions or comments about the project email the FBCLID2 General Manger at gm1@fbclid2.com.